Everything great! 10 out of 10! Awesome location, friendly and helpful staff, really really cool rooftop. Prices for drinks are a bit heavy though, but we could bring our own! I arrived earlier than the check-in time, but the staff was so accommodating; trying to find any open beds for me!! The location was way above my expectation. The atmosphere was so chill and relaxed. Highly recommend! This had to be the best hostel I have ever stayed at!! I will definitely be coming back. They were very professional and super helpful. Service was amazing. My room was amazing and I loved every minute of it. Everything is impeccable. Stay here. Amazing hostel!!! The staff were so nice and helpful and they were great at recommending places to see, where to eat etc. The hostel itself has an amazing rooftop bar with views of the city and the dorm rooms are so spacious with really comfy beds. It’s also in a great location close to all of the shops and restaurants. 100% recommend! Excellent hostel, couldn't fault it in anyway. Beds are big & comfortable with private curtain. Wifi is super fast. Staff were super helpful, so thankful for them. Special shout-out to Linyu - nicest guy ever 😁 Would 100% stay here again. Great hostel! Ladies at the reception are so nice and very helpful! Will definitely come back. Stayed here for one night before we went to Yangshuo and one night on our way back. The staff were all lovely and very helpful. 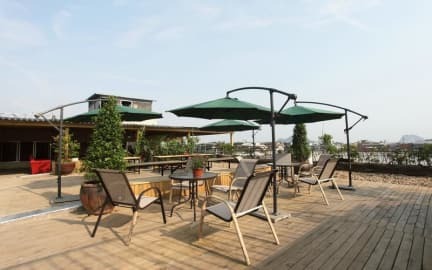 The garden rooftop terrace is amazing - especially if you manage to get a sunny day! They also have a pool table where you can waste some time if it’s raining. Would definitely recommend this hostel - you cannot beat it for value for money! Very nice rooftop. But the highlight was the kindness and availability of Li! Big hug to him! I was a little disappointed in seeing that they prefer chinese guests over western people, but hey that’s their choice!